Your face is your presentation to the world, so you want it to look its best! The most effective way to keep your skin looking young is prevention, but not many of us think about sunscreen and proper diet when we’re in our teens and twenties. But that doesn’t mean that we have to be resigned to looking our age (or older!) At Imagen we offer some of the best facial rejuvenation techniques available. As we age, we lose volume in our face. 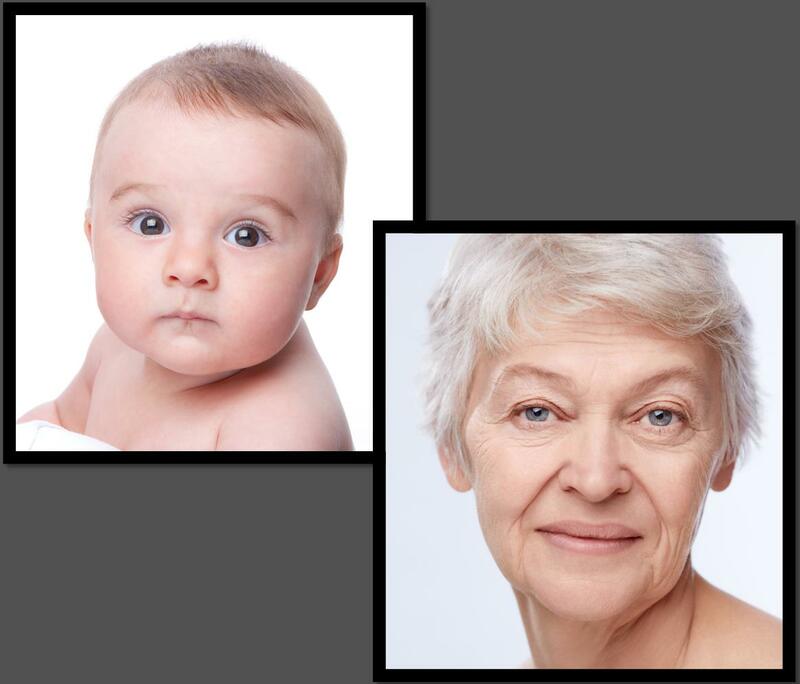 A baby has beautiful, full cheeks, but as we become older gravity affects those cheeks and pulls them downward, leading to a sagging of the facial skin as we lose the fat that once supported them. (For more on this topic, see our blog) At Imagen we use the the “Liquid Face Lift,” a combination of neuromodulators (Botox & Dysport) and injectable volumizers to replace the lost volume and take years off of your appearance. Botox and Dysport have been used by millions to treat their frown lines, but did you know that it can be used to prevent them as well? Regular injections with neuromodulators can help to retrain your muscles so that the deep frown lines don’t form in the first place. Botox can also be used for multiple other applications (see our blog on this topic), including lifting the brows and the tip of the nose and improving the appearance of a gummy smile. Injectable fillers like Restylane and Juvéderm help to restore some of the volume that is lost with aging. They can be used to fill the parenthesis lines around your mouth, but also the marionette lines. Fillers like Restylane Lyft and Voluma can also be used to add volume to your mid face, helping to lift your lower face. They can even be used to fill scars or smooth out your nasal contour. Restylane Silk is used to add volume and definition to the lips, giving you a soft, natural look. Sculptra is a volumizer that works by stimulating your own collagen production. It can be used as a filler for nasolabial folds (parenthesis lines) and for replacing lost volume in the cheeks or temples. Results can take up to six weeks before you can appreciate them, but they can last for over 2 years*! The Perfect Peel is a revolutionary chemical peel that incorporates Gluathione, a potent antioxidant, to offer an anti-aging solution. Glutathione also helps to reverse melanin metabolism, lightening dark pigmentations. The peel can also smooth tone and texture and improve acne and its scars*. Originally a medication for glaucoma, it was discovered that Latisse has the incredible side effect of increasing eyelash growth! In just 16 weeks, your lashes could be thicker, longer and darker*! Once you’ve reached that point you can use as little as 3 times a week to maintain your lovely new lashes*! A good facial maintenance regimen can help keep your face in it’s best shape, just like regular oil changes can keep your car in it’s best shape! We offer a full line of medical grade skin care products along with microderm abrasion and IPL. We would be happy to help you set up a maintenance program that is designed specifically for your needs. We also offer Facial Rejuvenation Packages. iS clinical, by Innovative Skincare, is dedicated to producing ground breaking, highly effective, clinically validated skincare products that deliver dramatic improvements to the skin. The products are developed using only the highest quality, pharmaceutical-grade, botanically-based ingredients. All iS Clinical products are are safe to be used by pregnant or breastfeeding patients and those undergoing cancer treatments. The iS Clinical line includes products for each step of your skincare: cleansing, treating, hydrating and protecting. -The Cleansing Complex deep cleans without drying, smoothing skin and minimizing pores. -Many of the products work to treat multiple skin concerns. The Serums provide anti-aging, anti-acneic, antioxidant benefits combined with brightening and tightening effects. Tri-Active Exfoliant is both a physical and chemical exfoliant, smoothing and polishing your skin while stimulating collagen synthesis. -Hydration is combined with treatment in several products, including Reparative Moisture Emulsion, Copper Firming Mist and Hydra-Cool Serum. SHEALD Recovery Balm reduces irritation, itching and tightness associated with many Medical Skin Treatments. -Protection is essential to prevent further damage to your skin. Extreme Protect SPF 30 provides unprecedented multi-level broad spectrum UVA/UVB protection and protects and repairs DNA and Collagen. The Regenica line from Suneva is at the forefront of growth factor technology and rejuvenation. Results can be seen after as little at 14 days of use *. –Renew Day Cream with SPF and Replenishing Night Creme help to rejuvenate your skin and Repair Complex can help you recover faster from laser or micro-needling treatments. –Regenica Eye Cream is specially formulated for the delicate under eye area and delivers growth factors to help improve under eye circles and bags. –Regenica Recovery Gel is great for use after injections or any injury. It contains arnica and aloe along with the growth factors to help heal bruising and soothe irritated skin. ReFissa is our Retinoic Acid product. It has the highest concentration of Tretinoin possible without the irritating side effects, making it ideal for skin rejuvenation. PRP – Is it the Fountain of Youth? The procedures above require absolute surgical accuracy and focus on critical details to give the kind of results you see in the Before and After Gallery *.